Good new for Windows Insiders! 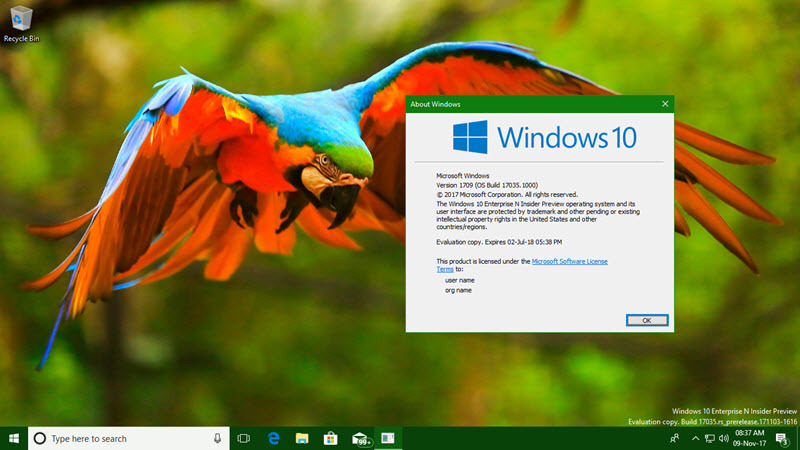 Microsoft released a new build (Windows 10 Preview Build: 17035) for the insiders in the fast ring as well as to the insiders who opted in to Skip Ahead. But, due to a bug, PCs with AMD processors won't get this build. If you are running an insider build, check for updates to get the new build, as it contains many new improvements. Don't forget to see the release notes and known issues. Now with build 17035, you can mute a tab playing audio in Microsoft Edge. If you are reading a free EPUB book in Microsoft Edge, you can now save it. You can now easily pin a book to Start or refresh the book, by right-clicking on the book in Microsoft Edge. You can now share files and URLs to nearby PCs using the new Near Share feature in Microsoft Edge. You can now limit the download bandwidth that is used in foreground downloads, when you click 'Check for Updates'. Some of the sound settings have been moved to the Settings app. This build adds additional Ease of Access settings to further round out the revamping of settings. With this build, the touch keyboard has been updated to have an acrylic background. The touch keyboard now supports the standard keyboard layout for all languages except Korean, Japanese, Traditional Chinese and Simplified Chinese. The button layout of the handwriting panel has been updated and a new animation has been added to it. You can now write a letter on top of another, and the handwriting panel will recognize your corrections more accurately than ever before. You can now draw a “split” gesture between two words in the handwriting panel to create more space between words. Apart from these new key features and enhancements, Microsoft fixed a bunch of other issues. To see the complete list of fixes and known issues, checkout the original Release Notes / Build Announcement. If you have come this far, it means that you liked what you are reading (Windows 10 build 17035 is now available with new enhancements to preview).